When Peter Boal stepped in front of the curtain on opening night of PNB’s season this past Friday, the audience gave him at least 15 seconds of applause. That’s a long time for us in Seattle. I clapped too—and this was even before the night’s performance proved that Boal has made significant progress in creating a company that can do, well, almost everything. Have we lost some beautiful aspects of the shining company Kent Stowell and Francia Russell turned over to him in 2005? Of course. But we have gained as well. What a night! 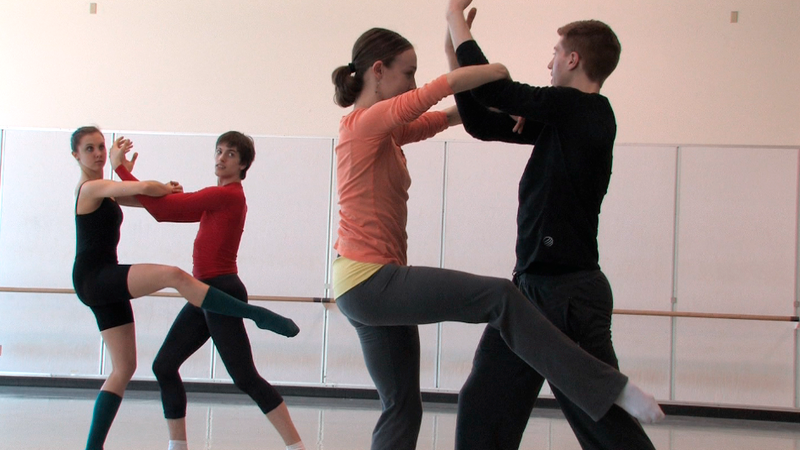 Two of the works on this Director’s Choice program are new to PNB: Jerome Robbins’ minimalist, driving Glass Pieces and Jiří Kylián’s hilarious Sechs Tänze. How exciting to have these fabulous works added to the company’s repertoire. They paired well with Kylián’s gripping, breath-stealing Petite Mort (new to the company last year) and Nacho Duato’s voluptuous, heart-wrenching Jardí Tancat (which entered PNB’s rep in 1996). A perfect program: one that feeds the soul, mind, and heart. except for the corps roles in the end, the dancers can really bring their own personalities and strengths to it. And we see so many of them! Newly in the spotlight? Corps members Magaret Mullin and Andrew Bartee, each of whom took on soloist roles in this rep.
Mullin has been a reliable member of the corps since she joined in 2008, dancing with confidence and able to channel her considerable personality somehow so that it doesn’t disrupt the corps’ unity. Don’t for a minute think that that made her a lifeless automaton. Even so, I wasn’t prepared for her performance at the Saturday matinee. In Sechs Tänze she carried off the comedy—she was clean and fast and funny. As she entered with Kiyon Gaines, they created one of those magical moments where the air between them became part of the dance as well. (Gaines was in his usual good form and he threw the audience into a fit of giggles as he wiggled (jiggled?) into one of the black prop dresses that are a running cross-dressing gag in the this piece.) Later in the afternoon, Mullin danced again with Gaines in Glass Pieces (they were the couple in minty green). She more than held her own in that role, easily standing out from the crowd of dancers as they moved along their trajectories with so much determination. Here’s her PNB bio. article on PNB School’s performance on Critical Dance. I mention…but you can definitely see his gorgeous extension. New, but not quite in the spotlight yet: apprentices Jenna Nelson and Price Suddarth. Suddarth had a more exposed role, dancing in the second male ensemble in Glass Pieces, keeping up with the oh-so-fabulous male corps and looking good. Also new and also not yet in the spotlight: PNB’s new music director/principal conductor, Emil de Cou. According to a press release, he’s working with Acting Music Director/Conductor Allan Dameron this season, will conduct some Cinderalla and Giselle performances this spring, and starts here fully next season. 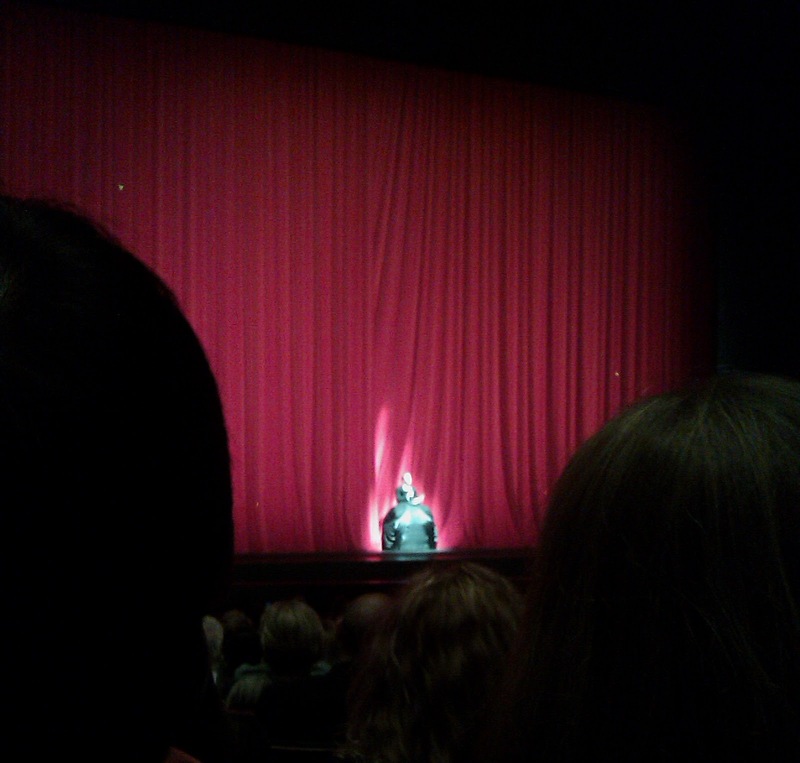 Some audiences heard him last season at PNB. (Quite nice!) When he finally arrives, he’s likely to find an improved orchestra, if this past weekend’s performance is any indicator. They sounded great, with only one tiny trainwreck in the Phillip Glass piece (and even that was fixed by the next afternoon.) Lucky us, to have live music. Thank you to the donors who make it possible. And shame on us audience members: why did folks talk through the musical interlude between the two Kylián pieces? More new stuff? Just when you thought you knew who Batkhurel Bold is as a dancer… At several points in Glass Piece’s second act (Facades), this powerhouse and Carla Körbes just stand, one shoulder slightly forward, arms rounded. How beautiful they looked together! This stoic man who partners so securely and then unleashes his impressive strength in JUMPS, matched her exquisite line, thrill for thrill, and, well, I could have watched them stand like that for hours. There’s so much to be said about partnering—and changing. Take, for example, Rachel Foster dancing with Lucien Postlewaite and Bold on the same night. Her intensity wasn’t a great match for Postlewaite’s elegance in Petite Mort, but it worked better with Bold’s dammed-up energy in Jardí Tancat. Postlewaite adjusted, and their pas de deux took on a harsher, more antagonistic, desperate mood than, say, the same duet showed last year with Kaori Nakamura in Foster’s role. On Saturday, Foster partnered with the elegant, amiable-looking Benjamin Griffith. They are good for each other height-wise, but the world loses something when Griffiths’ personality is muted. Here’s the thing, though: Can’t the same be said for Foster’s personality? Am I just unveiling my own bias against aggression? I have to say, though, that her intensity works so well in a lot of pieces. Remember her in Molissa Fenley’s State of Darkness a few years ago? OMG! Amazing! And Vespers? Wonderful. She can make sense of strange, contemporary movements. She’s super-fast and super-clean and graceful. And get a load of how beautiful and lifted her arch back is in this photo. Watching her, though, I feel like the conversation is between her and the dance. If the audience likes it, great. If not, no matter. And here are two questions I took home with me: (1) Is that wrong? Maybe not. (2) If she could change it on occasion (and you’ve got to believe this woman could do pretty much anything if she tried) should she? There is partnering on a bigger scale, too: I love it when the ensemble works together. In Jardí Tancat, the first night’s cast gelled in the third song. Or, to be more correct, gelled for me—with me might even be more correct?—at that point. What a shivery moment. How does this happen? Suddenly all six dancers are inhabiting the same world, dancing the same dance, breathing together. In my book, that’s one of the greatest arts. Saturday matinee’s group had it from the first silent moment of that piece through to the last powerful moment. At the end of Jardí on Saturday, my eyes were still tearing up. At the end of Sechs Tänze, my face hurt from smiling so hard. What other emotions were left to feel? We already had the mystery and sexuality of Petite Mort. The stark geometry of Glass Pieces was the perfect way to end the show. Peter Boal sporting a Petite Mort dress. Friday night’s performance was in part about PNB’s partners: the donors. It was actually one portion of an evening-long gala. Boal appeared onstage after one intermission to invite the rest of the audience to join the onstage party after the show (well, not for free, as it’s a fundraiser after all). Very funny: he was wearing one of the prop dresses from the Kylián works. “If you don’t have a dress, we might be able to work something out,” he said. It was actually his second appearance that night: he started out the evening introducing the folks who had received promotions over the summer: Seth Orza to principal; Sarah Ricard Orza and Laura Gilbreath to soloist. Lesley Rausch’s back—it found the luxuriousness of the music during one of her moments with Jérôme Tisserand in Petite Mort and was more heart-wrenching than the music in Jardí Tancat. Olivier Wevers and Kiyon Gaines dancing that hoe-down+leap moment of Jardí with a sproing that would remind you of Tigger if they weren’t so in tune with the mood of those Catalonian songs. The way Carrie Imler’s feet leave the ground—that incredible spring! Ariana Lallone’s passion in Jardí. Chalnessa Eames, who so often shows her love of humor in her dancing, taking Secht Tânze seriously and making it, therefore, even funnier. The look on Postlewaite’s face as the men pull the huge piece of fabric forward in Petite Mort. And, oh golly! Have we ever seen him in Jardí before? Wonderful! The women’s corps, so well spaced against that grid in Glass Pieces. The picture above does not do them justice. They’re getting it! How crucial is that corps! How together the men were in Glass Pieces: running, jumping—momentum, muscle, and music. There’s a thrill in that for sure. And Ezra, Ezra, Ezra Thomson who showed (hilariously) just how much he can say with a tilt of his head or a crook of his shoulder. What do we have here in that young man? I hope to find out this season! Click here for tix. And here if you’re 25 or under, since you can get cheaper tix. And here if you’re under 40 and qualify for Backstage Pass. As always Rosie, it’s a pleasure to read your thoughtful musings. Thank you for sharing them and your enthusiasm with us. I’d love to add a few observations. Petite Mort is exquisite–a perfect marriage of music, mood and motion. It’s simultaneously strange and beautiful. The seamless partnering and sculptural lines of Lindsi Dec and Karel Cruz were worth the price of admission alone. I could have watched them dance all night. This Kylian is a wonderful addition to the repertoire. The audience howled with glee through Sechs Tänze even though the entire ballet is variations on the same two or three gags. The powdered wigs coupled with disembodied heads suggested an alternate universe where the cast of Amadeus romps with Edward Gorey characters. Still, physical comedy is hard! Bravo to the dancers for being such good sports and making it look deceptively easy and fun to boot. Glass Pieces was the big disappointment of the evening. Perhaps it wasn’t warmly received at the premiere in 1983 because it’s just not very good. Mr. Boal likes to collect works of chosen choreographers. (Dove, Wheeldon, Tharp, Robbins) But, surely there must be another Robbins ballet that isn’t so dated and actually has some choreography beyond your basic aerobics class. I kept waiting for Olivia Newton John to come bounding across the stage singing, “Let’s Get Physical.” And if I want to see lots of people walking with purpose I can go to Greenlake. The second movement was the most interesting of the three and only because there was finally some dancing. Also a lot of posing. It was disheartening to see the corps girls (for the first time all evening) reduced to scenery, silhouetted blips on a piece of graph paper shuffling across the back of the stage. “Look Ma! I’m shuffling!” They had pointe shoes on (also the first of the evening) but I can’t recall if they ever had occasion to make it up to pointe. The third movement may belong to the ensemble, but by then, who cares? It sort of feels like the piece is building, but it’s really only the music that’s increasing in intensity, not the dance. By the end it looks like a nerve wracking exercise in counting with an occasional brave smile thrown in for good measure. Glass Pieces may have been cutting edge twenty-seven years ago, but so was Lycra, safety pins as fashion statements and big hair. IMHO, this ballet belongs in the time capsule with them. Thanks for the Green Lake joke. It made me chuckle! And…for the record…Last night’s performance: the Glass Pieces music was off (what happened?! ); Rachel Foster was SO ON, delivering a warmer performance than I’ve seen from her in ages—lovely! ; we got to see Carli Samuelson in a soloist role—nice fluidity and lift! ; Lucien Postlewaite’s hands continue to amaze me; Barry Kerollis was great in Sechs Tänze: perfect sensibility for that 18th century-ish farcical quirkiness—we don’t see nearly enough of him in this rep; Lindsi Dec and Karel Cruz were so beautiful together in Jardí…I’d go on and on but I’d be late for work. Hope some of you are off today, enjoying the sunshine in Seattle! I couldn’t disagree more with the first commenter who disliked “Glass Pieces”. Not everyone likes the same things, and that’s fine. He/she didn’t like it, and I loved, loved, loved it…..so what? None the less, to me this Robbins piece (which I hadn’t seen before….but will again tonite!) is sheer genius. To my way of thinking, first and foremost, one *has to* like Glass’s minimialist music to feel the power of this piece. Next, the artistry with which Robbins creates movement on such music of bare essense is……I’ll say it again…..genius. I’m happy for Mr. McKean that he “loved, loved, loved” Glass Pieces. I guess I’m sort of missing the “genius” in it, though. It may have been new territory for Robbins and NYCB in 1983, but the concept wasn’t really even all that original. Lucinda Childs had already been collaborating with Philip Glass and choreographed a piece in 1979 titled Dance that has some striking similarities; pedestrian movements, variation, repetition, accumulation and even a geometric grid by conceptual artist Sol LeWitt that factored into piece as background. As for having to “like Glass’s minimalist music to feel the power of the piece,” I disagree. I love Glass’s music. I just think other choreographers have better utilized the minimalist genre: Twyla Tharp’s In the Upper Room and Jiri Kylian’s Falling Angels are two that come to mind. I also loved the ballet Sense of Doubt Paul Gibson did for PNB a few years ago to Glass music from The Secret Agent. Mysterious, ominous and very creative. To me, Robbins answered the siren’s call to try his hand at Glass’s music like so many of his contemporaries of that era had. It was an interesting experiment that just didn’t deliver the choreographic goods. the robbins/glass combo was about as crowd pleasing a work of art as i have ever seen. it never occurred to me that it wouldn’t be acclaimed as such..